With plenty of opportunities in the Healthcare and IT job market – and a multitude of recruitment agencies staffing these positions – it’s easy to feel like you’re simply a drop in the bucket for most recruiters. Here at Global Service Resources we attempt to go the extra mile by promoting a candidate and client centered experience. We’re glad you’ve chosen to work with us – now let us tell you who we are and what we do just a little differently. 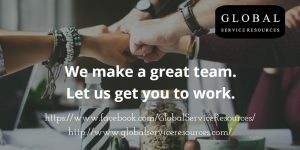 Global Service Resources has been providing excellent staffing services since 1993 operating as a boutique nationwide staffing agency for government and private contracts. Our sales office is located in Burbank, CA amongst the studios and suburbia that make this town one of the busier suburban districts in Los Angeles. Located close to downtown Los Angeles, Hollywood, and the booming “silicone beach” – we pride ourselves on diversity and new ideas. Our team members are diverse coming from various professional backgrounds such as sales, social work, and customer service – all of us eager to promote the success of our candidates and our agency. Currently our office specializes in the placement of healthcare and IT professionals and we are constantly expanding our services. If you’re a business owner looking for talent we’d love to hear from you – contact us! This year, 2018, we are fortunate enough to be enhancing our nationwide staffing efforts throughout the United States of America (take a look at the states we serve here). Our goal is to provide our excellent staffing services to nationwide clients as well as bring opportunities to you, our candidates. We specialize in the placement of healthcare professionals ranging from doctors to technicians and administrators. Whether you’re looking for a travel position or a per diem position close to home, we have you covered. Take a look at our available job openings – or contact us with a little information about what you’re looking for – our agents will be happy to assist you in your job search. IT professionals can expect a number of exclusive contracts located throughout Los Angeles County. We are proud to maintain a long standing relationship with our local county government – staffing many positions that support LA County’s large infrastructure. Positions ranging from support technicians to data architects are consistently available as the county population grows and the need for data management, support, and modernization becomes imminent. IT professionals can expect a courteous and informed discussion with our IT recruiters who are more than happy to review current LA County projects with you as well as guide you through the hiring process with the large government agency. Take a look at our current job listings or contact us and we’ll make sure to touch base with you in a timely manner. If you’re looking for a recruiting partner who can be a long-term ally for your career development reach out to a Global Service Resources recruiter today and see how our unique relationship-based approach can help find the right job for you. If you’re looking for a job, visit our job board to find your next great opportunity. Our recruiters are available to provide advice you can use. We look forward to hearing from you soon – we make a great team!